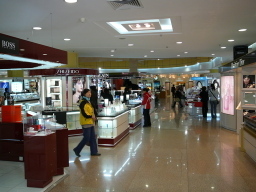 Tuesday past marked the beginning of Open Tuesday in Beijing. The inaugural Beijing event begins a number of co-operative efforts around open source investment and research between Finland and China. Open Tuesday itself was established in Finland to create and co-ordinate networking events around open source developers and business people. The event was split roughly into two parts. The first was very formal with short speeches from the Director of Tekes (Finland's government research funding organization), and representatives from China's Ministry of Science and Technology, and Ministry of Information Industry. These short presentations were critically important. As government officials, they all made very clear public statements supporting free and open source software usage in Finland and China going forward, in a room full of people, with press coverage. A lot of face will be lost if they change direction at this point. Mikko Puhakka, one of the founders of Open Tuesday (and an early investor in MySQL AB), and Petri Rasanen, head of Finland's Center for Open Source Software, gave talks, along with a Red Flag vice-president, and I finished the speakers ticket with a short talk on why open source software is important for China's economic growth. The officials and honoured guests all left to do official and honourable things together, and the buffet was opened to the rest of us. This second informal half of the evening was great! Unlike some events where you see one cultural group lined up on one side of the room and the other group lined up across the room, (not unlike boys and girls at a dance), here everyone was talking with everyone and a lot of new relationships were started. There were about 80 people attending and it was a great start to what will hopefully become a regular event. The Beijing event was supported by the Embassy of Finland Trade and Technology Center, China Co-Create Software League, the OSDL, and Turbolinux. The Finnish Open Tuesday partners include Tekes (the Finnish Funding Agency for Technology and Innovation), COSS (Centre for Open Source Software, Finland), Finpro (Finnish National Agency for Corporate Internationalization), Helsinki University of Technology, Finland UNIX User Group, and Tampere University. I traveled to Beijing last November as an invited speaker to a conference on Open Standards, IP and Innovation. I arrived in Beijing late in the evening, but all along the drive to the hotel there were signs for the China Africa Summit. 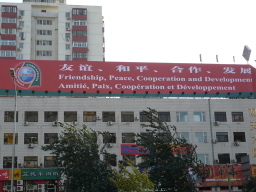 "Friendship, Peace, Cooperation, and Development" was loudly proclaimed in Chinese, English, and French. Over the next few days I realized Beijing was blanketed with these signs. Essentially, in its need for resources to continue to feed the maw of infrastructure development, China rolled out the red carpet to the African nations. This is apparently the third such summit, and the biggest. Many leaders of various nations were in attendance. Stop and consider what Africa and China together means. This is not simply resources to China. It means money into Africa. And as those battered economies start to improve, it means China is opening its next export market, likely on terms far more interesting to the African nations than any G8 economy is going to offer. The arrogance of assumed position in the G8 countries will cause them no end of grief here. In Angola a $4 billion line of low-interest credit enables Chinese companies to help rebuild the bridges, roads and so on that were destroyed in decades of war. The debt is repaid in oil. For Angola, which has been keen to get going with the reconstruction of its infrastructure, China's straightforward approach is an attractive alternative to the pernicketiness of the IMF and the Paris Club of creditors, which have been quibbling over terms for years. So it is with many African countries, fed up with the intrusiveness of Europeans and Americans fussing about corruption or torture and clamouring for accountability. Moreover, the World Bank and many Western donors were until recently shunning bricks-and-mortar aid in favour of health and education. China's credit to Angola is not only welcome in itself. It has reduced the pressure from the West. Thanks to China, therefore, workers from the Middle Kingdom in straw hats are now helping Angolans to lay down new rails on the old line from Luanda to the eastern province of Malange. Another railway, from Benguela to Zambia, once used to carry copper, is also being rebuilt. China is happy: the work helps offset some of its trade deficit with Angola. The Angolan government is also happy: it is rebuilding its shattered economy at last. Interesting things start to happen when China gains the support of 30-40 countries in large international organizations. Think about a voting block in the UN. As a sometimes standards wonk, I can't imagine what it will mean when the Chinese can start to drive their standards efforts and agendas through ISO differently. Of course the western news agencies covered the Western concerns raised over China's human rights track record and the possible support for less than free-thinking regimes in parts of Africa. I can only partially share the concern. I'm a Canadian, and like the U.S. and Australia, Canada was a colony. I'd observe, however, that the U.S., Canada, and Australia are "different" as colonies go. We obliterated the native culture we found and we are essentially extensions of the democracy that created us. Not so with the African colonies that have re-gained their independence over the past four or five decades with the waning of European colonization. I now live in the United States. If I understand the recent news, I am living in a country where I can be declared an enemy of the State, and locked up without recourse. The President can declare martial law and deploy the military against his own civilians. (I lived in Canada in 1970 during the October Crisis when Trudeau invoked the War Measures Act and put the army in the streets of Montreal at the height of the FLQ crisis.) Of course these powers would never be used irresponsibly. But what's the diplomatic message: "It's okay that we have these powers, but not you." Standing next to the Square in downtown Beijing, I can appreciate the horror of what happened here, but I'm afraid I don't see a difference from the Kent State shootings beyond a body count. President Nixon attempted to justify the Kent State shootings at the time with the statement, "This should serve as a grave reminder that when dissent turns to violence, it invites tragedy." I do not condone human rights abuses anywhere. The tragedy in Darfur is heartrending, and continues partially due to China's machinations in the UN Security Council, presumably in exchange for some of those Sudanese oil rights. What I do object to, however, is hypocrisy from the Western states. Our hands may be "cleaner" by some moral measure, but they certainly aren't clean. But let's focus on the economics instead of highly charged politics. 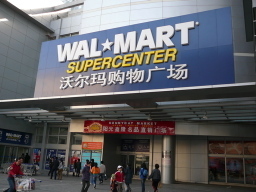 What I saw for the most part in my travels in Beijing were the effects of the boom and a growing middle class. Notice all the new cars and buses in the photo. The streets are overrun with new Hyundai Elantra taxi cabs and some form of Volkswagon that looks like a rebranded Passat. This is very different from the masses of black BMW and Mercedes of four years ago when I last visited. Then they were mostly company cars. Now people can afford cars as well. I saw a number of bicycle stores on my walks and taxi rides. The stores and sidewalks in front of them were packed with racks of new bicycle frames in bright colours. They still looked pretty rugged, no doubt to deal with the pot holes that litter the side streets, but apparently even bicycle owners can buy new bicycles. And yes, that is a blue sky in the photo. The smog was punishing the first few days in Beijing. Then a huge wind came through and we had awesome blue skies for several days. The smog was very reminiscent of the way my father talked about Los Angeles, CA in the early 1970s. Hopefully the Chinese government will tackle the problem soon, just the way other developed nations have so done. Traffic was certainly crazy. The government used the China Africa Summit to try (apparently successfully) the traffic procedures they will put in place for the Olympics. I also found out that WalMart has hit town. I wandered into the store because I just could NOT pass up the chance to see how the brand transfered. It was fascinating. It actually looked nicer — the aisles were not as crowded, and the clientèle felt more budget conscious than budget constrained. I passed what looked like a new IKEA store on the out skirts of town on my way to and from the airport. I would loved to have checked it out if time permitted. I wandered into the new Beijing Modern Plaza at the end of a long walk Sunday. This was much different. 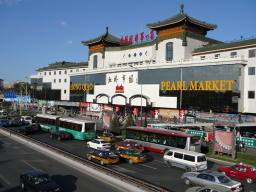 It is essentially a five story collection of upscale boutiques (all international brands) all under one roof — a glass and chrome upscale version of the Hong Qiao market. I had been walking for some time at that point so stopped in the Starbuck's for a latte. It was indistinguishable to my poor palate from anything I'd find in North America. The store held table space for about 40 people and it was packed on a Sunday afternoon. There were only a few of us that were visibly from somewhere else. The mall itself was again full of a well dressed middle class out for some Sunday shopping. As I pointed out in the post on the standards and IP conference, the Chinese are not mimicking the West. They are developing their own middle class culture. At a holiday party, a colleague suggested that the conventional wisdom that says the country that makes the most has the strongest economy may be wrong — it may be the country that consumes the most. If this is the case, then China is well on its way to world dominance by either measure. I had the privilege over several days on either side of the weekend of meeting with a number of small (20-50 person) Linux companies around Beijing. In each case, I saw a vibrant company aggressively looking for new opportunities. Most already recognized that they could no longer rely on a business culture based on depending on friends and family and the government for business connections. One company had reinvented itself 4 times over the past 10 years, re-purposing its Linux expertise on new and different embedded markets with new partners every 3-4 years. Another was rapidly moving from training to consulting. A third was rapidly re-inventing its hardware line. Each of them is growing. All of them live in the shadow of Lenovo. In the early 1990s we were all panicked by Japanese investment into North America. We were essentially "for sale" and we should all start learning Japanese. The Japanese real estate market tanked in conjunction with a lot of bad debt floated by the Japanese banks, and the "takeover" ended. China as an economic force is different. They aren't simply investing. They're building and consuming and exporting. When I started this post suggesting you should start learning Mandarin now, it's not that Chinese will replace the need for English as the lingua franca of global business. Rather to be completely successful internationally I believe it will be necessary to work in both. The Chinese are already rapidly learning English. If you only speak English, you will be at a distinct disadvantage as an international business "partner". The Economist ran an excellent article (as always) just prior to the Summit. [Unfortunately it requires a subscription.] It does a fine job of teasing out the political concerns as well as the economic, including the strong-arming in the UN Security Council from China on the tragedy in Darfur. The China National Institute of Standardization and Sun Microsystems co-hosted a one day conference on "Open Standards, IPR and Innovation" in Beijing. I was an invited speaker. The event's goal was to bring together a set of speakers that would provide different perspectives and practices on how standards and intellectual property rules play together inside and out of China, such that China can determine what will best work for them. 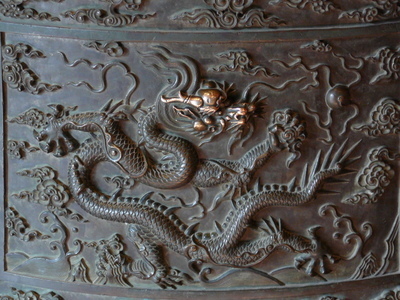 There is obviously a reasonable amount of tension between a handful of countries and China when it comes to claims of piracy, and as China's economy continues to grow, that tension has broken out in the standards arena as well with competing standards for such things as RFID technology and WiFi complicating the discussion. The great thing about the conference was that one felt the Chinese speakers and attendees were definitely attending to learn, but it was NOT to learn how to be more "western", but rather to learn so as not to make the same mistakes. The growing sophistication of business and business practices is palpable in Beijing in general, and definitely present at the conference. One thing that was also surprisingly apparent was the lack of patience with the multinationals and their pricing, Microsoft in particular. This was not an undercurrent in the presentations. It was right out there in the open. I remember getting into the debate a few years ago while still at Microsoft. Some managers took the position that countries like India would obviously want to mimic the "American" success of companies like Microsoft. The debate continues along the lines that India would obviously NOT want to use open source software because it's IP hostile, and they really need to build lots of proprietary software businesses because it's a demonstrated way to "make money" and grow the economy. Of course they would want to do so on a Microsoft software platform. First, open source software isn't IP hostile. It depends upon strong IP law. Second, countries such as India are service-based today, and that means EVERYONE gets to take home some money rather than focusing the wealth in the hands of a few. (The last thing India wants is a return to the days of the Rajahs with a handful at the top.) Lastly, (and this is the kicker), when you scale out the amount of economic growth that's taking place in countries such as India and China, the last thing they want to do is ship massive amounts of hard currency OUT of their economy to the U.S. for the privilege of developing software to improve business. (And Microsoft is a veritable Hoover in its structuring of its subsidiaries. No amount of in-country R&D re-investment can make up for the amount of money at risk here.) Open source rules in a case like this. Leap forward to China. Same story. Same debate. Same mistaken thinking from the Western multinationals that somehow China wants to be like them or worse yet, ship all that money out of the economy (government perspective) or the market (corporate perspective). I understand a naive Western marketing person's desire to believe that China is their next growth market but they fail to understand the economics involved. This is why Linux rules here -- the cost of goods sold is significant when you add up the royalty payment times the population of customers. I have held a Motorola Ming phone. Developed in China for the Chinese market. It is the sexiest little piece of hardware on the planet, and incredibly functional. It's Linux-based. Why would Motorola want to send that much money in royalties to Symbian or Microsoft? Yes, yes, I can hear the "we're so valuable" statements from those marketing managers already. Frankly, I don't really want to read Word documents on a two inch by three inch screen. The Ming is a work of art. But I digress. China is very respectful of IP. They value patents. They seem to be uninterested in supporting software patents. They do however understand how patents might make a mess of the standards world, and are very interested in work like the new ex-ante based IPR policy from VITA. This was the first event in which I've participated where there was simultaneous translation going on. My slides needed to be handed in a week in advance such that they could be translated as well. Wireless handsets were available so you could listen to the translation. While one screen had the slide in English, the other had the Chinese slide. Attendees and speakers simply worked in their native language. It was fascinating to see it all just work. I've posted all my photos on flickr from the conference and the conference dinners. I still need to get some names tagged, but it's a start. All in all a great conference. I learned a lot, and it was a privilege to participate. This is a Flickr badge showing photos in a set called Open Standards, IPR, Innovation Conference. Make your own badge here. 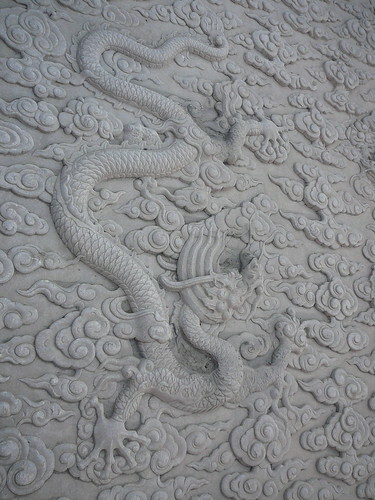 I am back to Beijing after an absence of almost four years. This time I will have a week to spend, with a standards conference anchoring the trip, but a little more sight seeing time and a number of meetings set up by friends. I started with a great meeting with Mingbao Liu, CEO of Beijing SunWah Future Software, and the makers of the SunWah Linux distro. 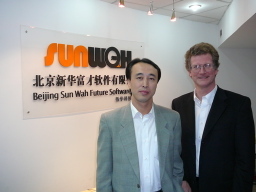 It was good to get his perspectives on his Linux and software businesses in China. China is definitely booming, and everything feels very different from the last time I was here. It's not simply a feeling of busier times, but more sophisticated times. I next had the privilege of meeting with Professor Lu Shou Qun, chairman of the China Open Source Software Promotion Union (COPU). He had many questions for me about standards, open source and IPR, based on my eclectic background. 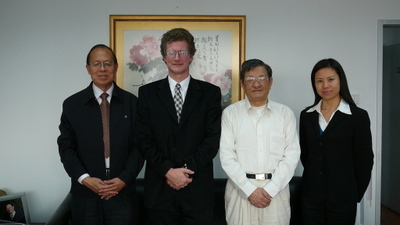 He shared his views on the importance of open source software to China's future. I also had the pleasure of seeing his "wall of fame" collection of photographs. Many people responsible for the successful communities and companies we take for granted in the open source world have visited with Professor Lu. All in all, an auspicious start to the week.